The weeks seems to be getting busier and busier, so my go-to dinners lately are sheet pan dinners. Sheet pan dinners are easy, relatively quick, one pan with minimal clean up...what's not to love?! It's fun to be creative too with meat & veggie pairings and seasonings. I use the large sheet pan in this set. Here are some favorites I have made recently and a few I want to try. Hawaiian chicken sheet pan dinner: I loved the pineapple in this dish! Parmesan pesto chicken sheet pan dinner: the ranch adds good flavor. Sheet pan shrimp boil: this is on my list for cooking this summer. Sheet pan fajita salmon: I've found salmon sheet pans to be delicious and so quick. Sheet pan baked ham & eggs: breakfast for dinner! Sheet pan Philly cheesesteak: this would be a good for a casual dinner party. 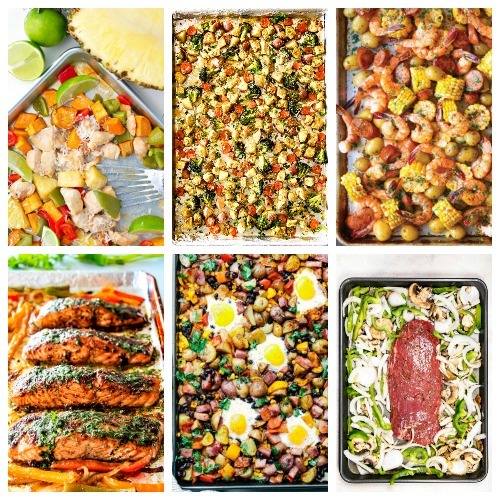 What's your favorite sheet pan dinner? What's your go-to easy weeknight dinner? PS: Sheet pan dinner tips for making your own.